Dharavi is a locality in Mumbai, Maharashtra, India. 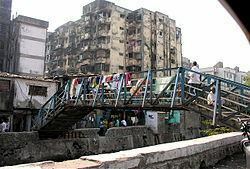 Its slum is one of the largest in the world; home to roughly 700,000 to about 1 million people, Dharavi is the second-largest slum in the continent of Asia and the third-largest slum in the world. With an area of just over 2.1 square kilometres (0.81 sq mi) and a population density of over 277,136/km2 (717,780/sq mi), Dharavi is also one of the most densely populated areas on Earth. The Dharavi slum was founded in 1882 during the British colonial era, and grew in part because of an expulsion of factories and residents from the peninsular city centre by the colonial government, and from the migration of poor rural Indians into urban Mumbai (then called Bombay). For this reason, Dharavi is currently a highly multi-religious, multi-ethnic, and diverse settlement. Dharavi has suffered from many epidemics and other disasters, including a widespread plague in 1896 which killed over half of the population of Mumbai. In the 18th century, Dharavi was an island with predominantly mangrove swamp.. It was a sparsely populated village before the late 19th century, inhabited by Koli fishermen. Dharavi was then referred to as the village of Koliwadas. Mumbai has been one of the centers of India's urbanization for 200 years. At the middle of the 19th century, after decades of urban growth under East India Company and British Raj, the city's population reached half a million. The urban area then covered mostly the southern extension of Mumbai peninsula, the population density was over 10 times higher than London at that time. Most parts of Mumbai faced an acute shortage of housing and serious problems with the provision of water, sanitation and drainage. Residential areas were segregated in Mumbai between European and 'native' residential quarters. Slums were heavily concentrated in areas meant for 'native' Indian population, and it attracted no planning or London-like investment for quality of life of its inhabitants. Unsanitary conditions plagued Mumbai, particularly in the so-called Native Town, the segregated section where Indians lived. In 1869, as with 19th century epidemics in European slums, bubonic plague spread in Mumbai and then across most of India. The epidemic killed nearly 200,000 people in Mumbai and 8 million in India. In 1880s, concerned about epidemics, the British colonial government expelled polluting industries and many Indian residents of the Native Town, away from the peninsular part of the city, to a distant edge of the city in the north in the village of Koliwadas. Thus was born Dharavi. The most polluting industries were tanneries, and the first tannery moved from peninsular Mumbai into Dharavi in 1887. People who worked with leather, typically a profession of lowest Hindu castes and of Muslim Indians, moved into Dharavi. Other early settlers included the Kumbars, a large Gujarati community of potters (another polluting industry). The colonial government granted them a 99-year land-lease in 1895. Rural migrants looking for jobs poured into Mumbai, and its population soared past 1 million. Other artisans, like the embroidery workers from Uttar Pradesh, started the ready-made garments trade. These industries created jobs, labor moved in, but there was no government effort to plan or invest in any infrastructure in or near Dharavi. The living quarters and small scale factories grew haphazardly, without provision for sanitation, drains, safe drinking water, roads or other basic services. But some ethnic, caste and religious communities that have settled in Dharavi at that time helped build the settlement of Dharavi, by forming organizations and political parties, building school and temples, constructing homes and factories. Dharavi's first mosque, Badi Masjid, started in 1887 and the oldest Hindu temple, Ganesh Mandir, was built in 1913. A large influx of Tamil migrants came in the 1920s. Bombay's first Tamil school and Dharavi's first school was constructed in 1924. At India's independence from colonial rule in 1947, Dharavi had grown to be the largest slum in Mumbai and all of India. It still had a few empty spaces, which continued to serve as waste-dumping grounds for operators across the city. Mumbai, meanwhile, continued to grow as a city. Soon Dharavi was surrounded by the city, and became a key hub for informal economy. Starting from 1940s, proposals for Dharavi redevelopment plans periodically came out, but most of these plans failed because of lack of financial banking and/or political support. Dharavi's Co-operative Housing Society was formed in the 1960s to uplift the lives of thousands of slum dwellers by the initiative of Shri. M.V. Duraiswamy, a well-known social worker and congress leader of that region. The society promoted 338 flats and 97 shops and was named for Dr. Baliga Nagar. By the late 20th century, Dharavi occupied about 175 hectares (432 acres), with an astounding population density of more than 2900 people per hectare (1200/acre). There have been many plans since 1997 to redevelop Dharavi like the former slums of Hong Kong such as Tai Hang. In 2004, the cost of redevelopment was estimated to be ₹5,000 crore (US$780 million). Companies from around the world have bid to redevelop Dharavi, including Lehman Brothers, Dubai's Limitless and Singapore's Capitaland Ltd. In 2010, it is estimated to cost ₹15,000 crore (US$2.3 billion) to redevelop. About 33% of the population of Dharavi is Muslim, compared to 13% average population of Muslims in India. The Christian population is estimated to be about 6%, while the rest are predominantly Hindus (60%), with some Buddhists and other minority religions. Among the Hindus, about 20% work on animal skin production, tanneries and leather goods. Other Hindus specialize in pottery work, textile goods manufacturing, retail and trade, distilleries and other caste professions - all of these as small scale household operations. The slum residents are from all over India, people who migrated from rural regions of many different states. The slum has numerous mosques, temples and churches to serve people of Islam, Hindu and Christian faiths; with Badi Masjid, a mosque, as the oldest religious structure in Dharavi. Dharavi is a large area situated between Mumbai's two main suburban railway lines, the Western and Central Railways. To the west of Dharavi are Mahim and Bandra, and to the north lies the Mithi River. The Mithi River empties into the Arabian Sea through the Mahim Creek.The area of Antop Hill lies to the east while the locality called Matunga is located in the South. Due to its location and poor sewage and drainage systems, Dharavi particularly becomes vulnerable to floods during the wet season. Dharavi is considered one of the largest slums in the world. The low-rise building style and narrow street structure of the area make Dharavi very cramped and confined. Like most slums, it is overpopulated. Compared to Mumbai's urban floor space index (FSI) of a range from 5 to 15, in Dharavi it is about 1.33. Government officials are considering changing the Dharavi's floor space index to 4. Despite the expensive Mumbai lifestyle, Dharavi provides a cheap alternative where rent is as low as Rs.500 per month. Dharavi has severe problems with public health. Water access derives from public standpipes stationed throughout the slum. Additionally, with the limited lavatories they have, they are extremely filthy and broken down to the point of being unsafe. Mahim Creek is a local river that is widely used by local residents for urination and defecation causing the spread of contagious diseases. The open sewers in the city drain to the creek causing a spike in water pollutants, septic conditions, and foul odors. Due to the air pollutants, diseases such as lung cancer, tuberculosis, and asthma are common among residents. 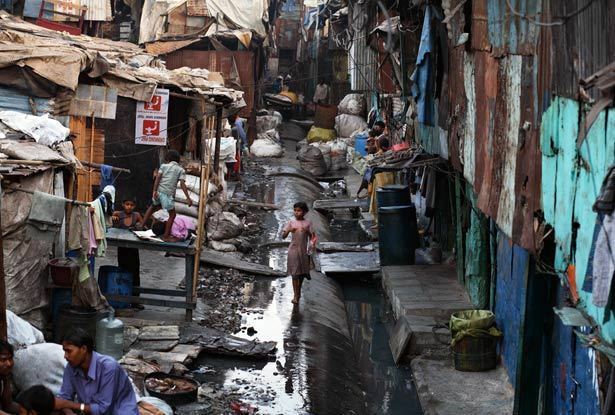 There are government proposals in regards to improving Dharavi's sanitation issues. Dharavi has been depicted in a number of Hindi films produced by the Mumbai film industry. These include Salim-Javed films such as Deewaar (1975), Mira Nair's Salaam Bombay! (1988) where several child actors were from the Dharavi slum, Vidhu Vinod Chopra's Parinda (1989), Sudhir Mishra's Dharavi (1991), Ram Gopal Varma's "Indian Gangster Trilogy" (1998–2005) and Sarkar series (2005–2008), Vikram Bhatt's Footpath (2003), Anurag Kashyap's Black Friday (2004) and No Smoking (2007), Madhur Bhandarkar's Traffic Signal (2007), Rajeev Khandelwal's Aamir (2008), and other films based on the Mumbai underworld. Dharavi has been depicted in films from other Indian film industries, particularly the Tamil film industry. Several films by Mani Ratnam based on the experiences of Tamil immigrants to Mumbai have depicted the Dharavi slum, including Nayagan (1987) and Bombay (1995). Dharavi features prominently in Danny Boyle's 2008 film Slumdog Millionaire; several of the child actors in the film are from the Dharavi slum. The movie Mankatha was shot there starring Ajith kumar. The movie Businessman was shot here starring Mahesh Babu. In Kaminey, the 2009 Hindi movie, starring Shahid Kapoor. In the 2009 Swiss/German documentary Dharavi, Slum for Sale by Lutz Konermann and Rob Appleby. In a programme aired in the United Kingdom in January 2010, Kevin McCloud and Channel 4 aired a two-part series titled Slumming It which centered around Dharavi and its inhabitants. The poem "Blessing" by Imtiaz Dharker is about Dharavi not having enough water. For The Win, by Cory Doctorow, is partially set in Dharavi. In the 2014 movie Bhoothnath Returns, Bhoothnath (Amitabh Bachchan) contests for election from Dharavi against Bhau (Boman Irani). In 2014, Belgian researcher Katrien Vankrunkelsven made a 22-minute film on Dharavi which is entitled The Way of Dharavi.